why does my form jumps to the top when i click next? On IE, my browser auto scrolls slightly down the page after I hit next. 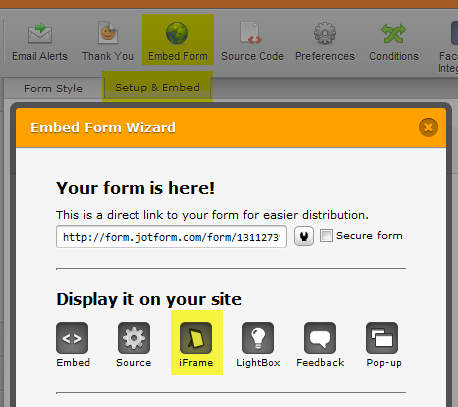 Could you please try to embed your form using iFrame option to see if that makes any difference? Unfortunatly, I still have the same problem and I noticed it also happens in Firefox. Is there any other posible way to fix it? so that your form's URL becomes http://www.jotform.com/form/12345678910?nojump . take note also of the structure of the URL. If you want the form to be secure, please use https://www.jotform.com/form/12345678910?nojump . Please try and let us know how it goes. Thank you for using JotForm! I still have the same issue... would it make any difference if I try a different embedding options? Please make sure to clear your browser cache after every change, its very easy for you browser to cache an earlier version of your code. I have tried both codes, but the problem persist. I cleared my cache as suggest too with no good results, is there any other thing I can do? You are more than welcome to check my code by visiting the website. I will pass this on to the developers and ask if this ?nojump feature is still working. This is a common issue with any iframes embedded into a webpage, there is workarounds out there but I cant really do much with the code in this instance because the form is on a different domain, meaning I cant access the parent windows controls to reset the browsers position. I will continue to try and think of some kind of solution. Hi cbtcollege, bug has been fixed. Can you test it again please ? Awesome! It works perfectly fine now! I need to add the ?nojump as above - but I already have one called ?Item=<?= $product->name ?> - which drags the product title to the email hidden form. Please keep us posted with the result. It no longer auto poplates the field? Can you please share to us the URL of this web page? I can't share the URL here because the site is in development but can you see the issue I'm having in a locked post with one of your guys "fxr" - can you see that post? I see.. sorry.. try to switch the places of the two. Nope - makes no difference. I think the issue is with JotForm as this was working earlier before I started to add the nojump. If I completly remove the nojump (and put it back to the way it was when it was working ok) it still fails. Would I be better to scrap this form and start again? I wouldn't scrap the form and start over, you have just been attempting to feed it parameters, the form itself hasnt been touched. You won't have 'broken' it. I would really appreciate you opening a new thread for this ?nojump issue and give as much detail of how far along you are as possible. Its much easier from a support point of view if our users open a new thread for each seperate issue they have. I will be able spend some time looking at the issue for you this evening. Also, please make sure that you visited the page properly and not just refreshed the browser. Sometimes you will need to like enter the URL and submit rather than just pressing f5 to make sure that the page has the properly updated contents. As I tried my last suggestion I was able to somehow make it work.